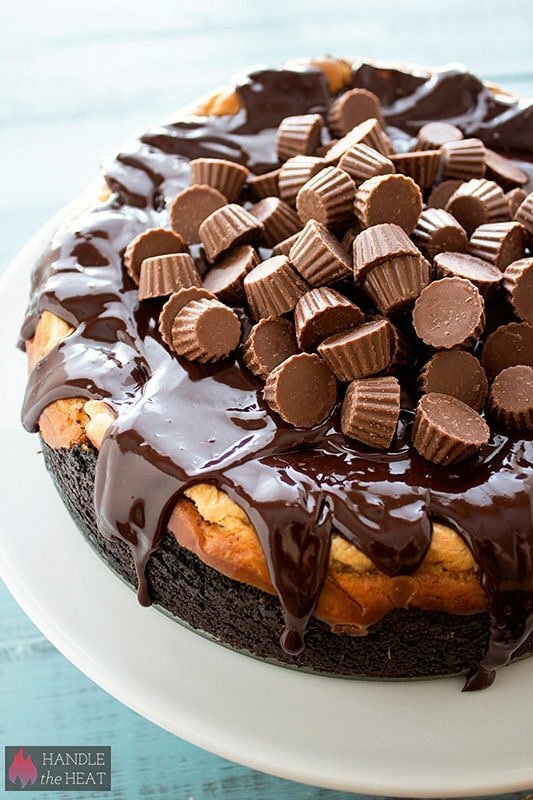 Peanut Butter Cup Cheesecake is the ultimate form of chocolate peanut butter indulgence and tastes as impressive as it looks! Taste: Like a gigantic tangy amazing peanut butter cup. Just incredible. Texture: The crust is buttery yet crunchy while the filling is lusciously smooth with bites of mini Reese’s cups. The chocolate ganache and pile of mini Reese’s on top just takes this cheesecake to a ridiculously awesome level. Ease: There’s three elements to this cheesecake, each of which will dirty a few dishes. SO worth it, promise! I didn’t even both with a water bath for this recipe because it doesn’t matter if it cracks, you’re just going to dump a bunch of chocolate on top. Appearance: This was seriously so fun to photograph, it’s gorgeous! Pros: My new favorite cheesecake ever. Cons: Not diet friendly, unfortunately. Would I make this again? Absolutely yes for special occasions! I am ridiculously excited to share today’s outrageously over the top recipe for Peanut Butter Cup Cheesecake with you guys. It’s seriously incredible. Just look at it!! It’s like a piece of art, a very delicious crave-worthy piece of art. You are going to flip when you take your first bite of this, and your friends will die when you show up to the next party with this in your hands. There’s nothing I love more in the world than the combination of chocolate and peanut butter so this cheesecake is pure bliss for me. What food is pure bliss for you? Preheat the oven to 325°F. In the bowl of a food processor, process the cookies until they are finely ground crumbs. Add the butter and pulse until moistened. Press into the bottom and halfway up the sides of a 9-inch springform pan. Bake for 10 minutes. Place on a wire rack to cool. In the bowl of an electric mixer, beat the cream cheese until smooth. Add the eggs, one at a time, beating until smooth. Add in the sugar, peanut butter, cream, and vanilla and beat until combined. Be careful not to overbeat. Stir in the Reese’s. Place the chocolate chips in a medium heatproof bowl. In a small saucepan heat the cream just until simmering. Pour over the chocolate chips. Let sit for 3 minutes before stirring until the mixture is melted and smooth. Pour over the cheesecake, allowing to drip down the sides. Sprinkle the Reese’s over the cheesecake. Serve or cover and store in the fridge for up to 2 days. Cheesecake is my favorite ever. Peanut Butter cups are my favorite ever. Holy Guacamole….I’m a cheesecake FREAK AND now your adding my two FAV’s??? I can’t wait to get my springform pan out & start baking!!! If I know ANYTHING it’s that you come up with some FREAKING AWESOME recipes & they ALWAYS turn out FABULOUSLY!!! THANK U SO MUCH!!! 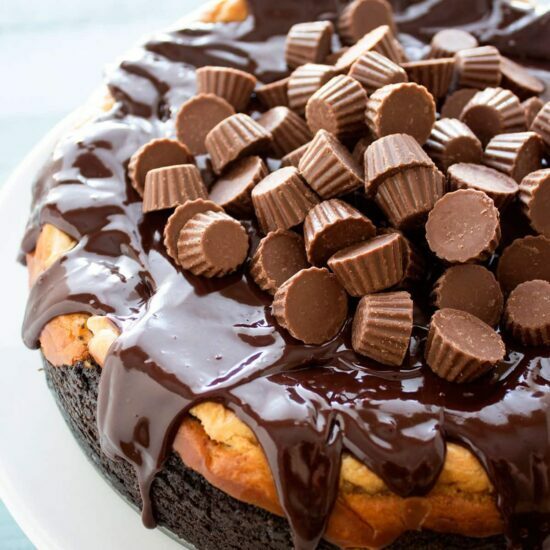 Chocolate and peanut butter is my favorite and this is over the top amazing! Question……..if you don’t have a spring form pan, and just plan on eating this at home (looks not important), can you bake this in a glass pan? Like 8 x 8 or something? Will that work? This recipe looks delicously decadent! I love it, love it, love it! Thanks for sharing! Tessa, this is in incredible! While I wouldn’t necessarily say that cheesecake is always “pure bliss” for me, the chocolate and PB combo definitely take it to that level! OMG This look so good, thanks for sharing! Yum! I love the pile of mini Reeses on top. 16-20 servings? In my house, it would probably be more like 4! Made this last night, finished it this morning. It is awesome!! Thanks for the recipe. It was really easy!! Thank you for the recipe! Making it this week for my peanut-butter-cup-lovin’ hubby’s birthday. I made this ( haven’t eaten it yet) and got a yucky crust on top is that normal ? I tried to slice most of it off. Looks amazing! 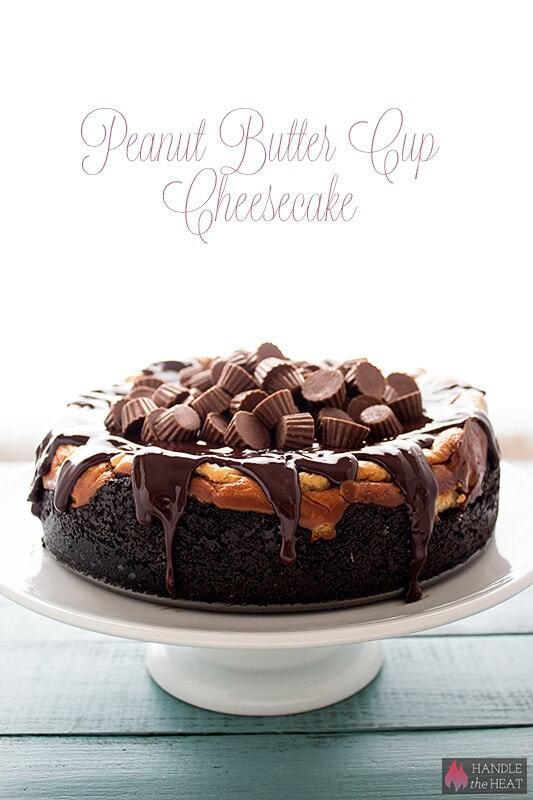 Peanut butter, chocolate, and cheesecake, I’m on board! I have made this twice now and it an amazing cake. I however am having trouble with the baking time. I have had to cook this for an hour and a half. It is cooling for now so will see what it is like this time. Last time baked it for an hour and twenty and was still to set in the middle. My neighbors boyfriend has requested this for his birthday cake. Did I read correctly about the 30 packages of Oreos? Definitely not 30 whole packages! It’s 30 cookies which equals one 15.35 ounce package. I just made this and it’s cooling. I baked for an hour and 10 minutes and it is dry on top but slightly wobbly. I hope it’s not too wobbly!! I can say definitively that licking the beaters was left solely up to me and neither of my two children were called down to help. Can’t wait to finish the top with the chocolate sauce and peanut butter cups! Also…I’m curious exactly how you slide this from the springform bottom to a serving dish. Pretty sure it’s gonna fall apart if I try. Any tricks/tips? I think it should be fine (you’ve probably tasted by now) but it’s better to err on the side of underbaking vs. overbaking. As for the springform part, I usually just leave the bottom plate attached and place the cheesecake + bottom plate on a serving dish. Are you using the whole Oreo with the filling for the crust or scraping the filling of before crushing them? Thanks! The whole Oreo cookie – no scraping!! I have just found this on pinterest and it looks so lush!! But was wondering if anyone has made one using Lacto free cream cheese and cream ? If so any tips on doing it differently or is it just the same? I LOVE this cheesecake! I’ve made it twice, and it’s nearly perfect every time. I say nearly perfect because both times, the crust has come out too hard. It’s difficult to cut. Do you have any suggestions? Do I have to wait until it’s been chilled before I add the topping or can I add it once it gets out of the oven? Don’t add it onto the hot cheesecake, it’ll just melt into a mess, at least wait until the cheesecake is at room temperature. 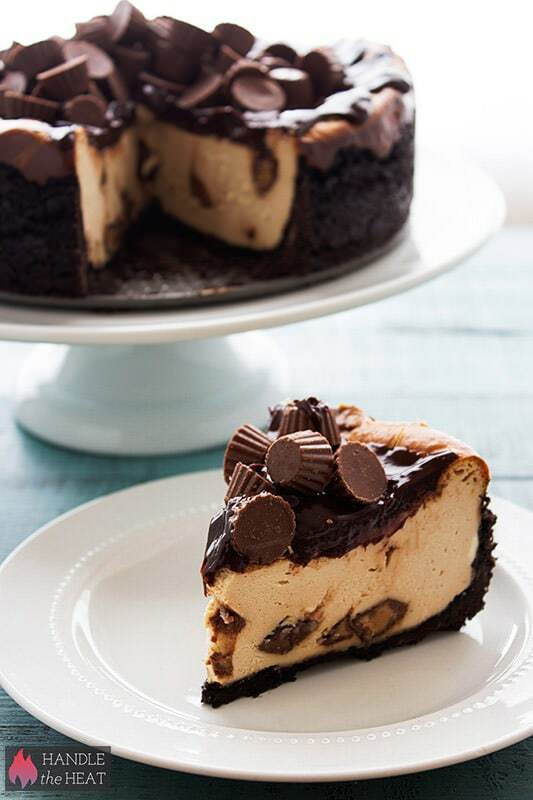 Your Peanut Butter Cup Cheesecake looks so delicious. Made this today for my boyfriend’s birthday. It looks incredible and was super easy to make. Thanks so much for the awesome recipe and I can’t wait to try it! I just saw this and it looks so delish! Can’t wait to make it! Thanks for shari! For the crust though, is it 30 oreo cookies with the filling? or just the cookies? Thanks! I’ve tried several different recipes with cheesecakes and I always use the water bath/ leave it to cool in the oven method. Anyone try that here? I want to make this for my husband’s birthday next week. I made this just recently and it was amazing. i did have to cook it for about 20 min longer then is said but that was ok. i also didnt use the mini’s i chopped up miniatures because the mini’s are a lot more expensive. I brought it to the office for a goodbye celebration and everyone loved it. Thanks for the amazing recipe. Hi there. Are we to bake teh cheesecakse at 325? It did not specif the temp for the cheesecake, just the crust. After 1 hour 15 minutes of baking it is stil very much not setup in the middle. Oreo makes a ready to fill crust. Has anybody made it with this? This recipe needs to bake in a springform pan, so a ready made pie crust will not work. You could use prepared Oreo crumbs though! 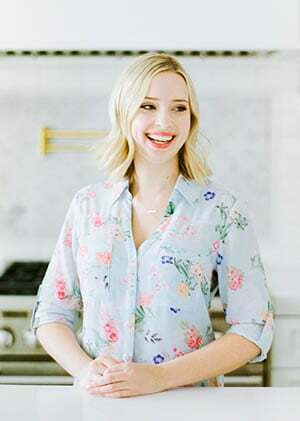 Hi love your blog great recipes. One question what is the temp and time to bake this magnificent confection? My 6 year old daughter made this for me, with my supervision, for my birthday this weekend and it was so delicious. I don’t even like cheesecake and it was amazing! So creamy, rich, peanut buttery, and I love the Oreo crust. It’s a fabulous recipe and a keeper. Thank you very much. I just made this cheesecake and not only was it one of the easiest recipes, it is so freaking good! It looks and tastes like something you would buy at a sweets shop. It’s so creamy and rich. I love it! Seriously?! My God! All my favorite treats in one recipe! Will definitely try this one! Thanks Tessa! Can this recipe be reduced to half? If yes, what would be the measurements? Thank you so much! What would you bake it in if you halved it? Do you have a 4 1/2-inch springform pan? Wow!!!! I was worried about having to cook it almost 1 1/2 hours, but the crust didn’t burn. It took extra time baking though for my oven. Listen, this turned out SO well!!!! Oh and I even made it gluten free by using the GF (glutino) sandwich cookies instead of Oreos. Worked GREAT! Thank you for this recipe, and I intent on trying many of your others! That’s great, Laura!! Glad you enjoyed the recipe 🙂 Can’t wait to hear what you bake up next. Made this and it was very good and very rich thank you! Just to let you gals know..I also made my crust with reg ores and peanut butter cup oreos…just to give it some variety! This looks amazing! Going to try this for my friends birthday. Do you cook the cheesecake at 325 temp as well? Can i omit the mini reese’s cups from the filling? And if im making it in a mini cheese cake pan do i make half the portion? Sure. And I’m not sure what size pan you’re using, but if it’s half the size of the pan I used then yes! Hi, this cheesecake look gooood ! What kind of cheese you’ve used? At what temperature to bake a layer of cheesecake filling? Cheers !!! I’ve made this 3 times now! It is fantastic and everyone loves it too! I had to make the following tweaks after my first one failed…1) needed to use larger springform pan 2) baked in a water bath 3) had to increase bake time to almost 2 hours and lastly 4) I added 1/4 cup flour based on another favorite recipe. Fabulous! Thanks for sharing. I made this for my work potluck on the weekend and it was a huge hit!! Definitely will be making again and again!! Yummy and so easy! How long will it last in the fridge without sacrificing taste? Hi, I was wondering do you bake the cheesecake at the same temp you bake the crust (325°)? Several ppl have asked, but you didn’t answer any one of them. Thank you for what sounds like an over- the- top- delicious cheesecake! This looks amazing. I’m going to try making it into cupcake size for a birthday at work. Thanks for the recipe. Your cheesecake recipes are to live for, not die for!!! Thanks so much for all the cheesecake recipes as I am totally addicted to CHEESECAKE!!! YUM!!!!!!! I was wondering if you can use milk chocolate for the gnash on the top instead of semi sweet? I made this for a friends birthday, it turned out amazing! Thanks for the recipe! My husband and I both love cheesecake! And, we both love peanut butter and chocolate/peanut butter cups. Just made this cheesecake again…for my husbands birthday. Love it! My husband and I both love cheesecake! And, we both love peanut butter and chocolate/peanut butter cups. Just made this cheesecake again…for my husband’s birthday. Love it! What pan are you using?